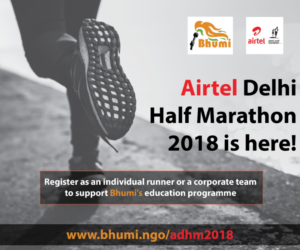 Bhumi is delighted to announce about the Airtel Delhi Half Marathon! Every year thousands of people participate in marathons. Some of them run for fun, some for fitness, and others for causes close to their hearts. This year, let’s run for the future of India – for the education of underprivileged children supported by Bhumi. The Airtel Delhi Half Marathon will be held on Oct 21, 2018. And like last year, Bhumi is one of the charity partners of this event. Bhumi provides comprehensive educational support for over 25,000 underprivileged children across India to become better citizens of tomorrow. Bhumi bridges the gaps in formal education and opportunities by providing language and STEAM education, life-skills support and scholarships for higher education. Get your corporate branded as ‘Corporate Cares’ team by fielding 12 – 60 employees as part of a group run. Last date Sep 5, 2018. 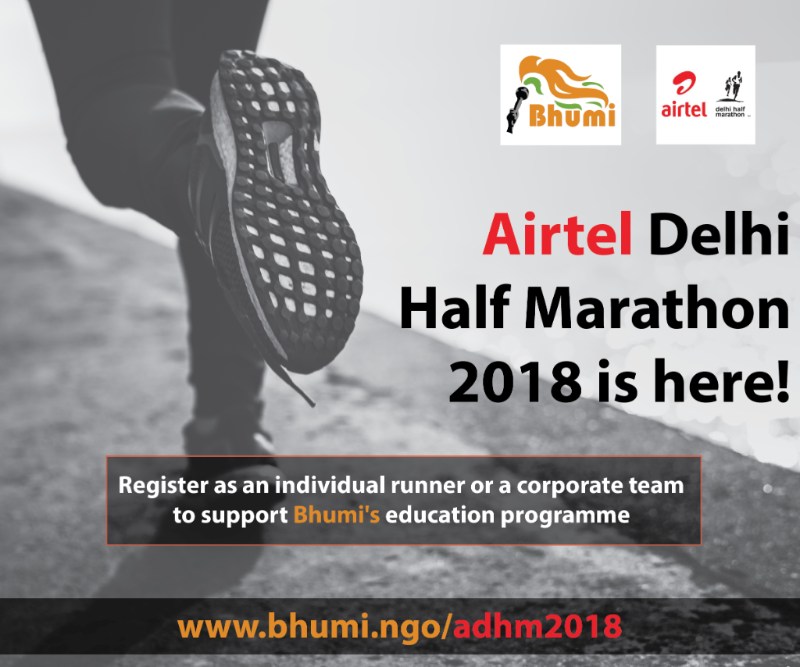 The Corporate Cares category lends companies a unique opportunity to combine Health & Fitness, Employee Engagement and CSR by supporting Bhumi through Airtel Delhi Half Marathon 2018. Register below and we’ll get in touch with you immediately. What are the benefits of fundraising for Bhumi? *Conditions Apply – factors dependent on race organisers/deadlines etc. It’s not just about participating in the event. It’s about running for yourself – running for the cause. It’s about telling everyone what a motivated lot of young individuals can achieve!